I recently featured my entryway makeover and was flattered to get a lot of compliments and excitement about my DIY boot tray. So for all of you who asked for it, here are the full details on how I made this boot tray! I initially decided to get a boot tray so I would have some place to put my shoes when I walked in the door and was too lazy to put them away (this happens 90% of the time). 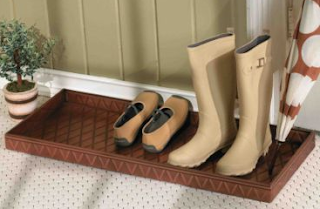 I also wanted a boot tray to gently hint and encourage guests to take off their shoes before tracking dirt onto my carpets. I found this very cute boot tray from Ballard Design, but was not willing to accept their $49 price tag. The boot tray is a great deal for just $5.24. Walmart had two different varieties, a curvy plain boot tray and one with scalloped edges. 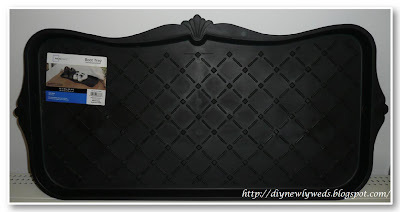 I chose the the scalloped edge boot tray since I think it is prettier and has more detail. 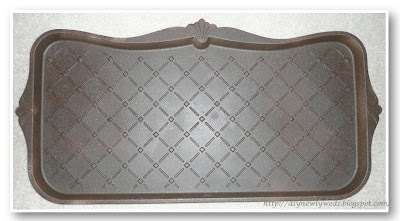 The scalloped boot tray is by Mainstays and is called the Majestic boot tray. 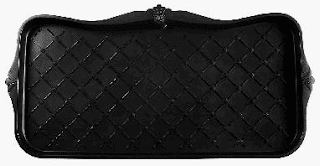 I think the design of this boot tray mimics the fluer de lis pattern of the Ballard boot tray. 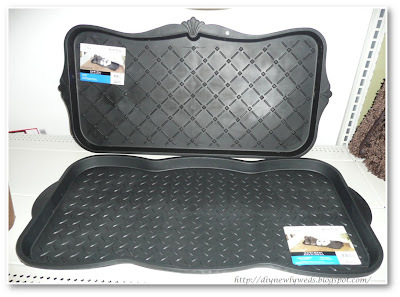 When I went back to Walmart for these photos they only had black boot trays available, but when I purchased the boot tray originally it was available in tan. I bought the tan because I figured it would be easier to spray paint than the black tray. I painted the boot tray using Rust-olem American Accents Stone finish spray paint in mineral brown which gives the boot tray a warm color and a nice texture. A couple of coats later, I waited for the paint to dry and voila, your own boot tray! 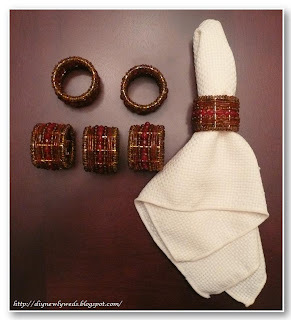 I'm sharing this project on DIY Day, Transformation Thursday, Thrifty Thursday, and DIY Home Accents. Check out the other great projects featured. 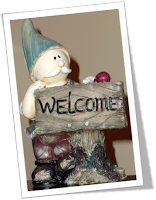 I hope you are enjoying reading as I work on my house, and maybe even getting a few ideas for your own home. If you have any suggestions for this blog, requests for anything you'd like to see me post about, or just want to drop me a note, feel free to email me directly. Boy, was I disappointed when I didn't find a single thing to buy there! 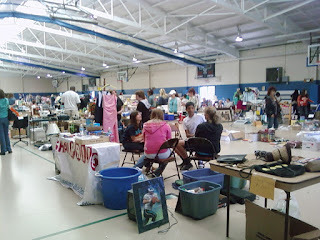 But I learned a good garage sale lesson, when sellers are charged $10 to set up a table, they tend to overprice their stuff! I won't be going to that sale again, lots of stuff but nothing to buy. However, I did hit the jackpot going to individual sales from around the neighborhood. I got the best buys I've found all season and it definitely made up for the disappointing indoor sale. First, I bought this mountain bike from a neighbor for just $10. It has some scrapes here and there, but since I know that I'll realistically only ride it a few times a year, it's perfect for $10. At the next garage sale I found this cute chef basket for 50 cents. I think it can be used as a little bread basket, but instead I plan to use it as a place to drop my phone, sunglasses, and other miscellenouse things in the kitchen rather than messing up the kitchen counter. At the same garage sale, I found a 8x10 version of a photo frame I already have. For 50 cents it was a great deal! She also had a box of free stuff where I picked up a pair of binoculars and a frisbee. All this stuff for just $1! I also picked up 2 books at other garage sales, but my biggest find was at the last yard sale we went to. For just $4 I picked up this solid wood table. Yes, this very ugly old table. Why am I excited about it? Because it's just the size I need and I already have a plan in the works to transform this outdated table into something fresh and new. Stay tuned! I'm sharing this post on Thrifty Treasures. White Paint - A can of crisp white paint should never be too far away. White paint can transform so much! 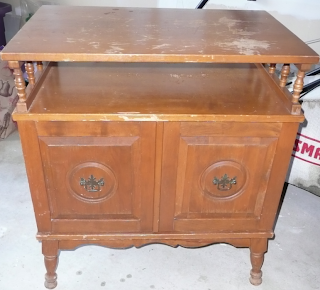 Have an ugly old wooden dresser? 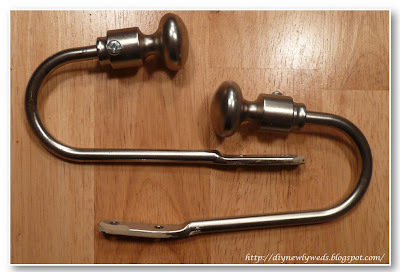 Paint it white and add new hardware for a new look. Have a room that looks too monochromatic and bland? 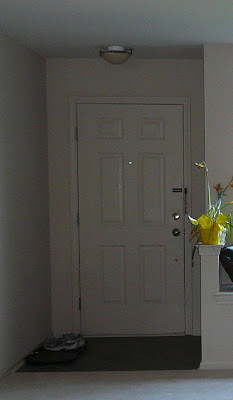 Paint the trim white to make the wall color pop out. 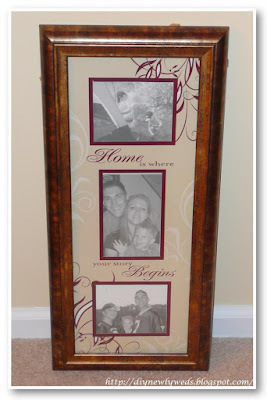 Tired of the way that picture frame looks? 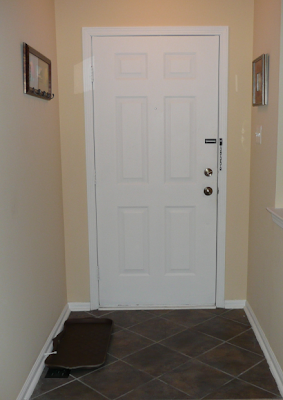 Try painting it white for a new look. Ah, the possibilities are endless. Garage Sales - As you may have noticed by my garage sale finds posts every Monday, I have a bit of a garage sale addiction. As I like to say, it's like Trick-or-Treating for adults. I love the thrill of the hunt, never knowing what treasures you can uncover. And the bargains you find can't be beat! Don't believe me? Check out some of my past yard sale finds. 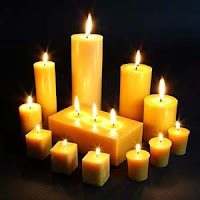 Candles: I can't think of anything else that can so easily and cheaply add to the ambiance and decor of a room. Candles can be used indoors or out and can be put in an endless variety of cute lanterns, holders, and candelabras. In the dining room, they can be used to set a more formal mood. In the family room, a scented candle can set an inviting and comforting mood. And in the bedroom...do I even need to explain...they can set a romantic mood! Library: The library you ask? Yes! Why subscribe to home decorating magazines you'll only read once and then throw out (hopefully you'll recycle them at least). Be more green and save some green by getting your favorite magazines from the library. If there's a project or recipe you want to hold onto, photocopy the page or see if it's posted on the magazine's website to either bookmark or print out. The library is also a great source for all types of home improvement books. There are home decorating books to give you design ideas, home improvement books that can teach you how to fix or build things, landscaping books about plants/flowers/trees, books about hosting parties, craft books, etc, etc, etc! But you don't have to take my word for it. 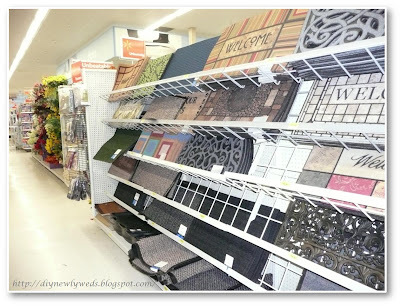 I'm sharing this post on Hooked on Houses, Inspired Room, and Finer Things. Time for another price match up game. I've noticed that many of my favorite stores are carrying very similar home decor items, including lighting fixtures. Prices can be drastically different between stores for very similar items. With a little digging, you can often find a cheaper version of your favorite lighting fixture that you many have seen is some pricier home stores. Can you tell these expensive lighting fixtures apart from their less pricey counterparts? How did you do? Could you tell which were the discount lighting fixtures? Do you think the more expensive ones are worth the money? A friend of mine recently enlisted my help to redecorate her bedroom. She currently has a plain bedroom that she'd like to add some style to, but doesn't have tons of time to do a big renovation and can't break the bank redesigning the room. 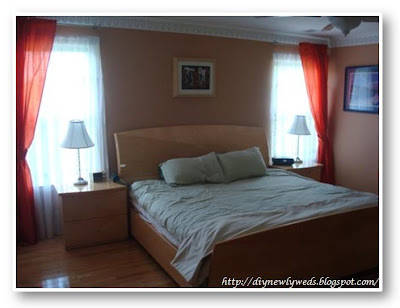 The furniture has to stay but the decor, fabrics, bedding, and wall color can all be changed. And to throw one more challenge into the mix, she's not sure what type of look to go for. The room has beautiful molding so she considered playing up the formality and going for a luxe french look. Or she considered going with a green scheme by using a green duvet cover she already has and really likes. Another option is to go for a tropical themed bedroom. The master bath is decorated in Hawaiian theme which she really loves and brightens her day. Lot's of possibilities! 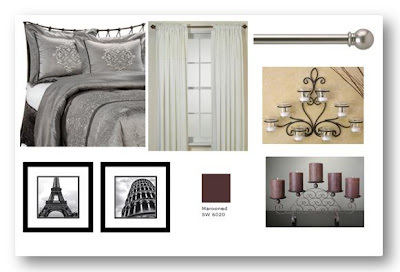 To help her with her decorating conundrum, I put together a few style boards to design each of these bedroom looks for her. First up, a fresh modern green bedroom. Since she loves the color green, I picked lively green bedding with a fun modern print. 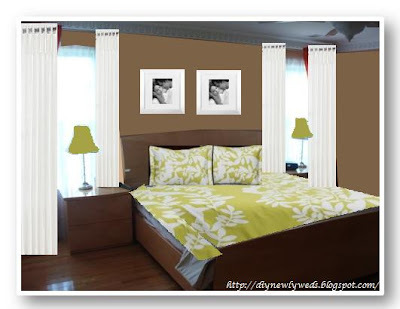 I chose a light brown for the walls because it compliments the bright green bedding well and adds some contrast against the light bedroom furniture. To play up the fresh and modern look some more, I added white accents like the crisp white curtains and white picture frames over the bed. In the frames, she can add some colorful nature prints or black and white photos (she already has lots of beautiful wedding photos). Finally, I suggest keeping the current lamps but adding green shades to them to complete the green look. Fun, fresh, modern! The next look is quite the opposite. I put together a luxurious romantic French inspired bedroom. The main focus of this room are the rich fabrics. I suggest draping the entire wall behind the bed with several panels of thick off-white curtains. This adds drama to the room and gives it an upscale, romantic feel. 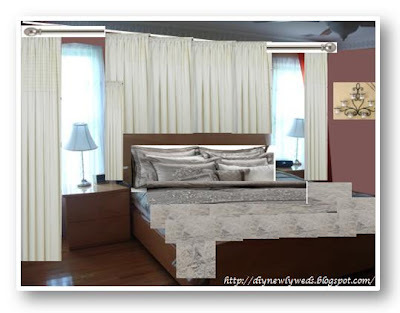 I also chose sophisticated silver bedding for the room which looks very opulent. A candle wall sconce adds even more romance to the bedroom. Since so much light fabric is being used in the bedroom, I paired it with a deep plum color for the remaining walls. Romantic, luxurious, sophisticated! The third bedroom design, takes yet another entirely different approach. Because she loves her tropical bathroom so much, I designed a tropical inspired bedroom. The key here was subtly with the tropical decor, it's important to balance the tropical decor without going overboard with big Hawaiian print bedding or very loud colors. First I chose a toasty color for the walls which is dark enough to offset the bedroom furniture, but still looks natural and sandy. 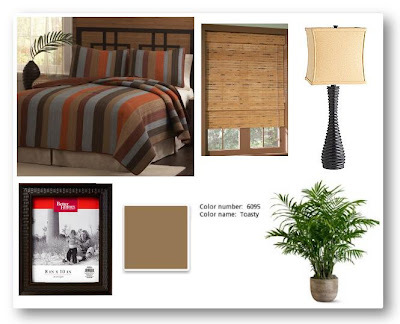 The comforter set is made from a natural looking fabric with pretty orange and turquoise stripes which manage to remain subtle and earthy. I chose to keep her existing orange curtains, but added some very tropical bamboo blinds. The lamps are replaced with wooden looking ones, adding to the warm tropical feel. 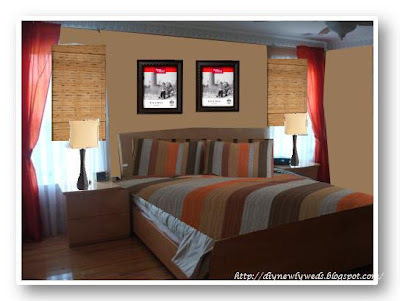 To finish the look, I added two woven picture frames behind the bed. 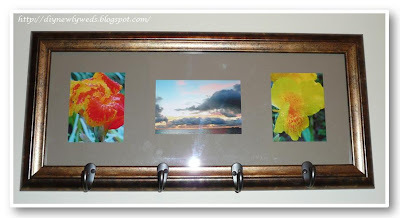 She can add her favorite vacation scenery photos to these to compliment the tropical look while adding a personal touch. Warm, tropical, fun! She now has lots of options and ideas to redesign her bedroom. 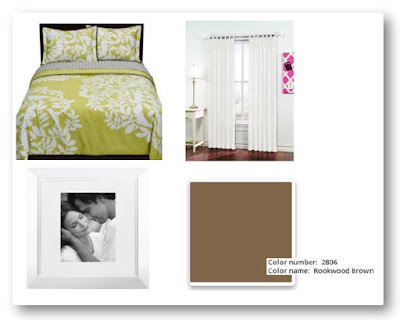 She can even pull her favorite aspects from each design to compile the perfect bedroom retreat. Which bedroom design is your favorite? This redesign is shared on Diy Day and Transformation Thursday. Summer is my favorite time of year and I'm not ready for it to end. I like to stretch my summers out as long as possible and I refuse to wear a jacket until at least October! Luckily, we've been having beautiful summer-like weather over the past few days in the Northeast. I'm trying to savor this nice weather and spend as much time outdoors as I can. 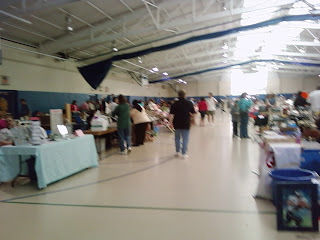 Despite it being a little drizzly (but luckily warm) on Saturday, I headed out to a few garage sales. The first few brought me no luck, but I found two great finds at the last garage sale I went to. I got these silver curtain holdbacks at a garage sale for just fifty cents! They're small, so they will be perfect for the narrow windows in my family room. I really like the round finials, but the silver finish doesn't match with my bronze curtain rods so I'm planning to redo them with a little spray painted. Stay tuned to see how that turns out. At the same garage sale, I also found this set of six napkin holders for $2. Since napkin holders can cost $2 each in stores, I'm pretty happy with this find. They will match perfectly with my red accented dining room and the red table runner I've been working on. To find garage sales, I've always just looked on Craigslist, but I recently discovered the site Tag Sell It that lists garage sales in any easy map format once you enter in your location. I did a Google search and discovered a few similar sites, but this seems to be the only one that actually had yard sale listings for my area. How about you, did you find any good garage sales this weekend or know of another site to find garage sale listings? These finds are shared on Thrifty Thursdays, Thrift Store Thursday and Goodwill Goodies. 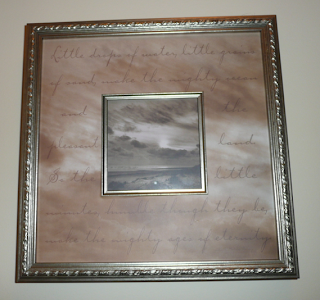 But we didn't have a good place to hang this frame and I wasn't crazy about the lettering written on. 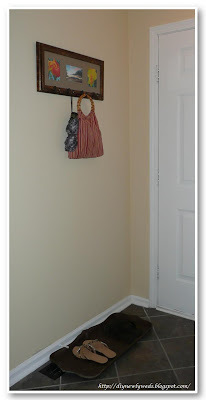 After shopping around for coat hooks and shelves, I couldn't find anything slim enough to fit behind my front door and decided to make a DIY coat hook myself. The first step was to replace the matting since I wanted to get rid of the lettering on the existing matting and needed to hang the frame horizontally. I bought some poster card-stock at AC Moore and laid the existing matting on top. 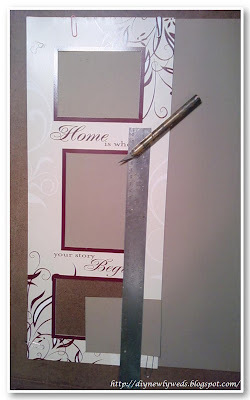 Using a sharp exact-o knife and a metal ruler as a guide, I cut out new photo openings in the card stock. Once this was done, it was time to add coat hooks to the frame. I bought two double packs of oil rubbed bronze finish robe hooks from Target. 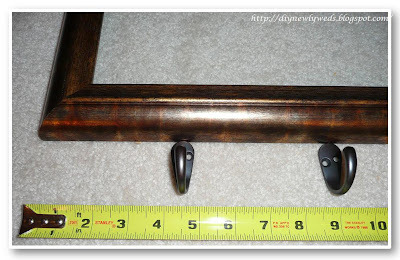 To figure out how far apart I should place the four robe hooks, I measured the length of the entire frame which was 22 inches, I divided this by 5 (there are 4 hooks, so divide by 5) and placed a coat hook every 4.4 inches. I attached them using a cordless drill and the screws that were provided along with the hooks. Make sure you remove the glass before drilling anything, so you don't accidentally drill into it and break it! 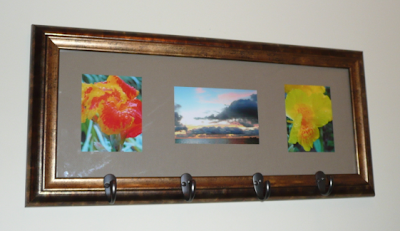 Once the hooks were in place, it was time to add the matting and new photos to the frame. Since this was going to hang in my new diy entryway that I would see whenever I walked into the door, I wanted to hang photos that were cheery and would make me happy. I chose 3 photos we had taken on our honeymoon, 2 closeups of exotic flowers and 1 photo of a gorgeous sunset. 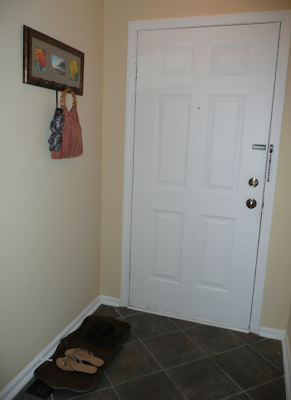 The vacation photos make the entryway and coat rack look more personalized. 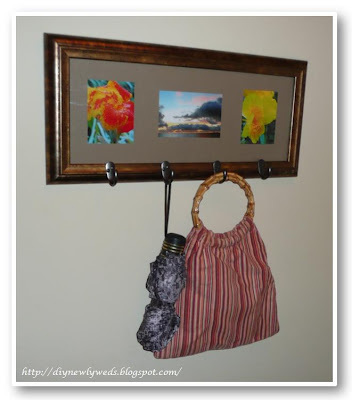 Once the photos and new matting were in, I was ready to hang my new coat rack! This project is shared on Today's Creative Blog. 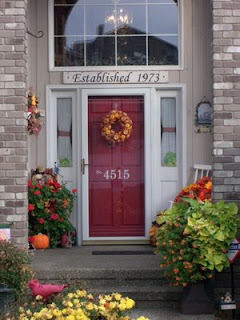 Painting your house number on your door is a great way to add style to your entrance and allow your house number to easily be seen. 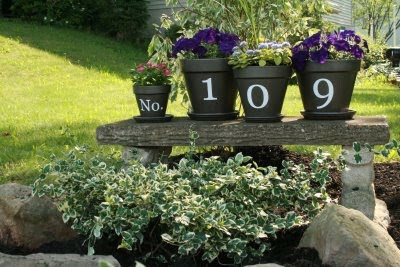 One of my favorite home address projects are these diy planters which are a fun way to display your house number in the summertime. 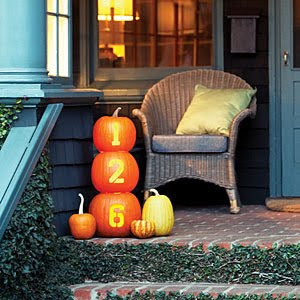 In the fall, pumpkins can be carved or stenciled with your home address. The pumpkins below look very festive and elegant. 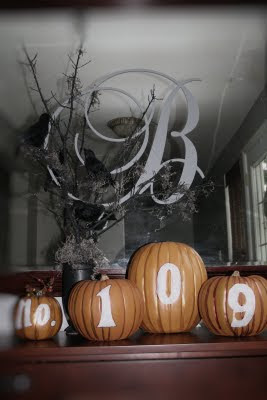 I bet they would also look very cool for Halloween with the house numbers written in a "spooky" font. 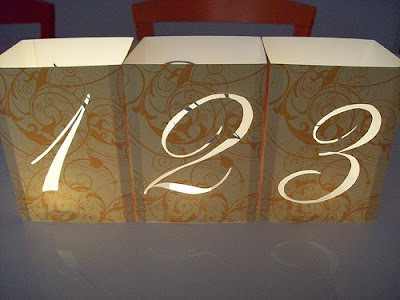 Lanterns are another place to display your house number. These lanterns were made for a wedding, but I think they would look really cute on a front porch showing off your house number. For a more durable lantern, I would try painting the house number on the inside of a mason jar or other glass jar and setting a candle inside. You could also carve or punch holes into a tin or can in the shape of your address and use a candle to illuminate. Any other ideas to DIY your address?